Mowing Slopes Safely – Let’s Get Real About Hills. It’s time to stop complaining and get real. You will not be able to mow all of your lawn with a lawn tractor or zero-turn if there are slopes. The truth: Residential Lawn Tractors and Zero-Turns are not designed to mow on slopes steeper than 15 degrees. They all tell you that in the manual. There are mowers designed to mow hills but the cheapest one on the market is over $10,000. The good ones are in the $20,000 to $50,000 range. Making myself more comfortable on a slope is not my goal. Not rolling the tractor or zero-turn is my goal. Rolling the tractor is not worth cutting an extra bit of grass. It is just grass. If it is too steep to mow, turn it into a landscape bed or wildlife area. On steep slopes, GO SLOW. Sidehill mowing, watch the front uphill tire to verify it’s making a solid depression in the grass. If it isn’t, SLOWLY turn downhill. Always have an escape route when mowing or traveling over rough ground so if the machine kicks out of gear or the brakes fail or both you can steer to safety. Keep the brakes properly adjusted and maintained. 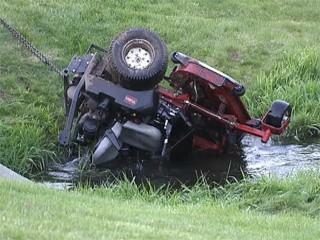 Be very, very aware that going up a steep slope how quickly and easily a tractor will flip back on you. If the front end does come up, the rear wheels provide the motive force to flip it back. Generally speaking, brakes are for stopping, NOT slowing down in tractor usage, that’s what the trans is for. If you step on the left pedal you set the parking brake and the rear wheels will lock. In most cases this will not hold you on the hill, instead, you will slide down the hill. The “GO SLOW” mentioned above means regulate your speed with the transmission. Choose a lower or lowest gear, with a hydro, do the same, keep the RPM’s (engine speed) up. Can a tractor mow this hill? NO! Zero-Turns are not weighted to mow up a hill. Especially older zero-turn mowers. They will tip over backward. If you cannot back up the slope or if you feel uneasy on it, do not mow it with a ride-on machine. Mow up and down slopes with a lawn tractor, not across. Watch for holes, ruts, bumps, rocks or other hidden objects. Uneven terrain could overturn the machine. Choose a low ground speed so you will not have to stop or shift while on a slope. Do not mow on wet or damp grass. Tires may lose traction. Do not mow on drought-dry grass. Tires will lose traction. Always keep the machine in gear when going down slopes. Do not shift to neutral and coast downhill. Avoid starting, stopping or turning on a slope. Keep all movement on slopes slow and gradual. Use extra care while operating the machine with grass catchers or other attachments; they affect the stability of the machine. Do not use them on steep slopes. Do not try to stabilize the machine by putting your foot on the ground. Do not mow near drop-offs, ditches or embankments. 46 inch 2 blade decks on lawn tractors do not have the clearance between the rear of the deck and the rear tires to install tire chains. Don’t even consider using a rear mounted bagger on hills. On both tractors and zero-turns that makes them too heavy in the rear. Don’t even consider a leaf/lawn vac on slopes. The transmissions in lawn tractors are not heavy enough and you will destroy the trans. On garden tractor, there may be too much weight on the rear hitch. Blow the leaves to the bottom of the hill with a handheld blower or backpack blower, then pick them up with your vac. Do not mow near drop-offs, ditches or embankments. 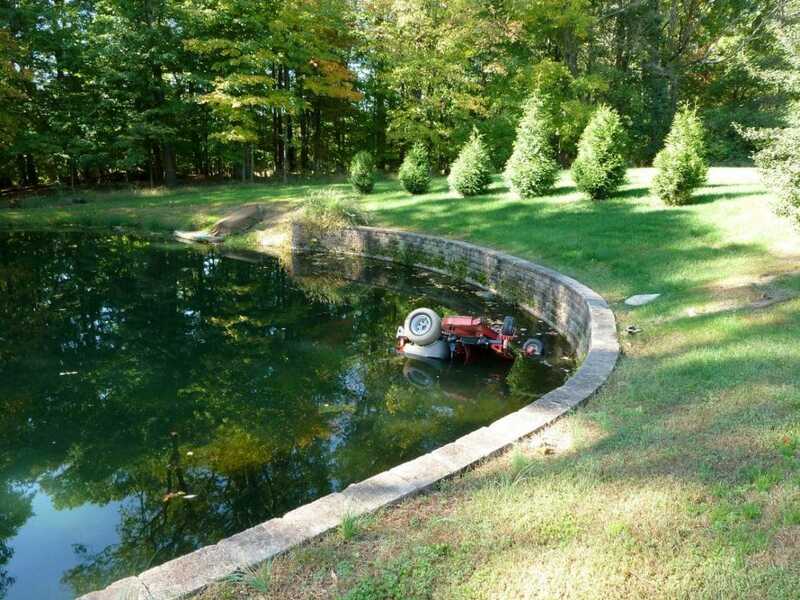 Don’t mow near a pond. 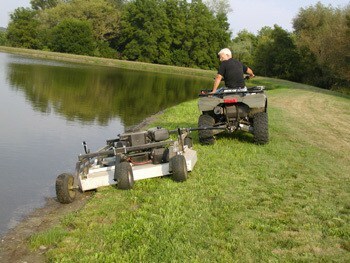 The first 6 to 10 feet of turf by the water’s edge is water-logged and your mower will sink in and tip over. Follow the rules in your operator’s manual. But remember, an unseen hole on the down-slope or a bump or stick of wood on the uphill side can increase your slope quickly and cause an accident. Notice the dual wheels on the ATV? There are a few tractors with a rear differential lock from Craftsman Pro, Cub Cadet and Husqvarna that give you better traction going up and down slopes, but they are still only rated for 15 degrees. There are other mowers that will handle slopes but all of them are commercially rated. Standon Mowers, 60 inches and larger like the Wright Stander are capable of mowing greater than 15 degrees. Toro Walk-Behind commercial mowers with the T-Bar steering also work well. 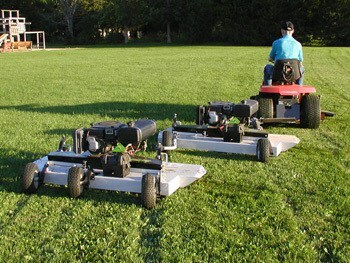 Of course, there are the dedicated slope mowers like the KutKwick and the new robotic mowers. Many people don’t read the operator’s manual or feel these warning statements are “just guidelines.” Even staying under 15 degrees there are still ways to tip your lawn tractor or zero-turn mower over. Mowing commercially for many years I have had too many close calls and I still use my “Pucker-meter” all the time. The seat of your pants is the best gauge – really. It is a long, slow, careful learning experience. You have to get to know your machine and how to best approach various terrain. Going slow and low is always good. If is feels wrong, if the hill feels too steep, if the tractor doesn’t feel right, I don’t mow it. What we tested, what we found. We compared several zero-turn-radius riding mowers marketed to consumers with a lawn tractor on slopes ranging from roughly 5 to 20 degrees. We used a typical 4.5 mph mowing speed over both dry and wet grass, going up and down as you should with most ride-on machines. So far, so good. The trouble began when we made a hard turn down 10- to 15-degree slopes. The zero-turn riders lost most of their steering control, skidding straight into our simulated hazards. All could stop in time when the brake was applied, though stopping entails manipulating two levers that also do the steering. That’s less intuitive than a tractor’s foot brake. And while the zero-turn models steered controllably at slower speeds, time savings is a major selling point for zero-turn machines. 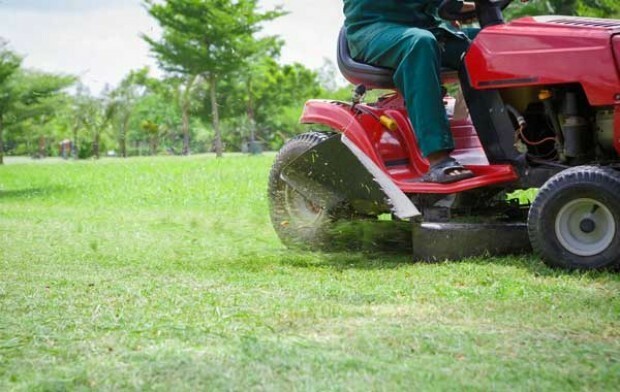 Rollovers are another concern with all ride-on mowers, contributing to the more than 15,000 injuries and 61 deaths associated with those machines for 2007, according to estimates based on CPSC data. Commercial tractors and riding mowers often include a roll bar, called a rollover protective structure (ROPS), and a safety belt. Both are supposed to work together to protect and confine the operator if there’s a rollover. But even that approach leaves lots of room for error. Choose a front-steering tractor over a zero-turn-radius rider if you’re mowing slopes 10 to 15 degrees or greater. (A 10-degree slope rises roughly 20 inches over every 10 feet.) If you already own a zero-turn-radius riding mower, be sure to mow slowly on hills. And mow only on dry grass to maximize traction. Give yourself time to learn the controls on any ride-on mower, especially a zero-turn mower’s levers for steering and speed. Mow straight up and down slopes with a tractor or rider unless the manual says otherwise. And mow side-to-side with walk-behind mowers, start at the bottom and work up-hill. Always turn uphill. I have a corner 1 acre lot with the front and side having a10-15 degree slope. I have 3 large oak, maple trees and flower beds. I have been using 2003 white outdoor lt-1650 x 42deck lawn tractor with bagger. I am looking to replace the machine and I am considering cub cadet lx 46 or Husqvarna YT46LS. I would appreciate all recommendations what is the best lawn tractor for my needs . I am 70 would like to make the right choice best buy. The manufactures slope recommendations are NO JOKE! I went to the edge of a big drainage and the brakes failed and I had one hell of a ride down into a flowing drainage culvert. Luckily in seconds I raised the deck and shot off PTO in the nick of time. Thank god for 30 years of maintain biking, skiing, 4-wheeling, etc., I couldn’t drive it for an after hour rolling it. Hi Paul. I just purchased a house with .68 acres and 2 very steep slopes (about 12 to 16×30) and multiple minor slopes, and trees. I kind of wanted to go alittle bigger than 22inch but I definitely feel limited in productivity. ZT is obviously out and im assuming tractor is too much mower for too much obstacle. Self propelled? RWD or AWD? Whatcha think?? I need to get a new push mower for our yard. We have 1/3 of an acre with the yard at a 20 degree to 30 degree slope. I know I need a self propelled push mower, but which ones are ideal for this situation? Also, I am not very strong so I need the mower to do the work. Paul, thanks for the suggestion. Unfortunately the web page states delivery or store pickup not available in my area for the Craftsman Pro 50″. How does the Craftsman Pro Series 50″ 26 HP V-Twin Kohler Garden Tractor with Turn Tight® Extreme compare to the Craftsman Pro Series 46″ 24 HP V-Twin Kohler Riding Mower with Turn Tight® Extreme? What am I losing with the 46″ Yard Tractor compared to the 50″ Garden Tractor? Hi I live in Woodstock, Ontario, Canada, we have a 40 acre campground with all sorts of terrain. We have a big Kubota tractor for most of the grounds, however it cannot fit in some areas like the mini golf course and most sites. I am left with too much push mowing. I was looking for a smaller mower with a smaller deck (28″ -36″ maybe) that could go on slopes and fit in tight spaces with zero turn. One of the bigger areas i have to push mow is about a 45 degree hill. My slope is around 30 degrees, but the area is small. It is four feet high and 100 feet long. A push mower solution is fine. I prefer a self propelled and know that typical small tires on a push mower just will not work. The surface is not terrible, but uneven enough to stop a standard small tire push mower. What about push weed trimmer mowers? We appreciate your insights. Thanks in advance. We live in Knox Pennsylvania. Have 4 acres to mow. Some rough areas. About two acres on a fairly steep slope. What kind of a riding mower do you recommend? I live in southern missouri and have 1 acre not very rough but with a 15 slope. The bottom of the hill is just an opposite slope to my road so not too crazy of a hazard. I want a riding mower and was going to go with a zero turn but am rethinking it after everything I’m reading. I can’t spend anymore than 2500. Please help my wife is getting angry with my indecision and the yard is getting pretty tall. We have a 6.3 acre farm, mostly divided into pastures for 2 horses. What mower would you suggest? Just purchased a house in Kalamazoo, MI. Have 5 acres, will be mowing about 2. Yard is very rough, and I am trying to reclaim some of it from brambles, brush, and dense woods. Have some slope (walk out), lots of trees, and sandy soil. I am looking for something that can haul a yard cart, roller, etc- and not be overly rattled by the lumps, bumps, and tiny stumps that litter this lawn. Any suggestions? Thanks for taking the questions. 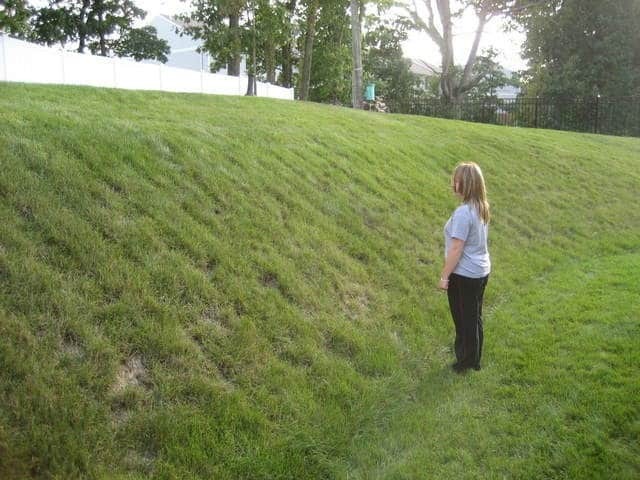 I am purchasing a place with approximately an acre of grass with slopes up to 15 degrees. Up to this point I’ve been aiming for the John Deere S240. What are your thoughts? There are sections of slope even steeper, there I intend to put in terraces. Also, much off this country (Washington state west of the mountains) stays soggy. Any additional ideas as to which type mower sounds best? Thanks again…99% sure that’s the one I’ll get. About the Poulan Pro 960420184…Amazon says speed shifter on fender, your site says foot control which sounds better…the only lever I see is for blade height…can you clarify please? Thanks…those are some of the models I was considering after reading many of your articles…You da man!! I live in Spring Hill Tennessee. Use a Honda push mower…about to buy a house on one acre with a sloping backyard with many trees, somewhat flat front yard…what kind of riding mower do you recommend? Thanks.. Thank you! Having left a flat land farm when I went to college, I am now retired and have purchase a new home in the country. Five acres to mow. On a slope. You may have just save my life as we received a ZTR along with the property. I am heeding what you say.